Grab your 10-gallon hats: Singer-songwriter Kristen Merlin will perform at this year’s Spring Fling Rodeo Roundup on April 26. The country singer was a semi-finalist on season 6 of NBC “The Voice.” She released her first EP “Boomerang” 2015, and has shared the stage with artists such as Shakire and Sugarland. 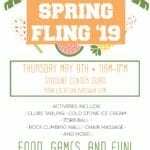 Spring Fling runs from 11 a.m. to 1 p.m. April 26 on the west side of the Student Services Building and will feature a rodeo theme with a mechanical bull, sand art, photo booth and more. Merlin will perform between 11 a.m. and 12:30 p.m.